Fabufacture’s fire exit markers have been developed and produced to offer a faster, more efficient way of creating a clear zone and prominent signage for your fire exits. 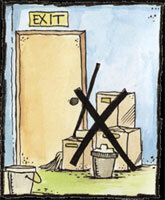 Factories and warehouses can, at times, have fire exits blocked due to boxes, tools and many other items being left in front of them. This situation can cause major safety problems in times when the premise is at risk of fire. Made from high quality anti slip materials, the panel enables the internal and external floor areas of fire doors to be easily marked giving clear instructions to keep clear and boundaries of storage, therefore making the environment safer and organised to work in. Compared to stencilling, masking and painting, with waits in-between for drying times, Fabufacture’s alternative is a one piece, adhesive application, that takes literally minutes to apply, and can be used immediately, complete with an industry standard anti slip surface. With strong self-adhesive backing these panels can be used both internally and externally in all types of facilities and be installed by you! Our Fire Exit Markers are available in sizes of 1 metre x 1 metre, and 1 metre x 1.5 metres, ensuring that if your fire exits are double or single doors, you will have the correctly sized application for them. 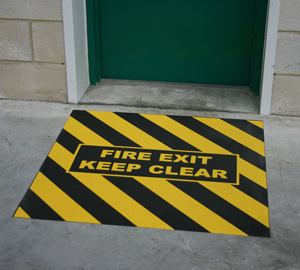 Fabufacture’s fire exit signs come pre-printed with ‘FIRE EXIT’ and ‘KEEP CLEAR’, complete with yellow/black chevrons, coated with aluminium oxide grit and a permanent, strong-bonding adhesive coating.